Since the time display is on a separate PCB which for this project is self-contained, the circuit is actually quite straight-forward and is summarised in the schematic below; an external crystal for timing and the four input buttons, and a data connection to the display. This lack of complexity is why it has been so long before I did this project — compared to the wiring up of LEDs or the LCD panel, it is a trivial reheat of an existing design of mine. There are some interesting implementation decisions which are covered below. The LCD time display PCB was designed to package up all the complexity of the LCD wiring into a daughter-board, and it involved quite a few tricky design decisions. 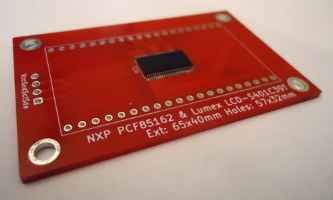 The first was to have the pin-to-segment mapping follow that suggested in the PCF85162 data-sheet, something that as it turned out required using a four-layer PCB, and even then fanning out all the driver pins and routing the tracks to the LCD pins was a challenge. In hindsight I have no regrets about doing this, as using expedient non-standard wiring for LED displays has come back to haunt me in the past. I also took the decision to hard-wire all the I2C address pins to zero for the address 0x70 because track routing was a challenge as-is without worrying about the three address pins, although this assumed that the LCD display would not be on an I2C bus with other slave devices. For all the previous timing circuits I used the PIC12F1822 for the timing itself, and in order to use much the same firmware & circuit design I will use the PIC16F1823, which is the PIC12F1822 with a few extra pins. This allows me to use the same external crystal wiring I used for the previous LED-based timers — an oscillator setup I know to work and be accurate — whereas the extra pins allow for more buttons to be used. 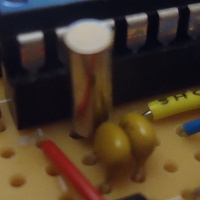 There are also built-in weak pull-up resistors on all pins that can selectively be disabled, which negates the need for external resisitors to avoid floating button states, although it means button input being active-low rather than my favoured active-high. Having solved the problems I was having with in-circuit programming headers, and then remembering how much of a pain swapping chips between the 17-segment LED mainboard and a programming seat, I am disinclined to even consider the latter if I can avoid it. With this circuit it accounts for a significant portion of the total circuit construction effort, but I now don't question its value. The only irritation is that some circuits, and this circuit is one of them, do not operate properly if the programmer is left connected and powered up. Although I never tried quantifying the error margins my overall experience with the internal PIC clocks is that they are inadequate for timing applications, so an external oscillator is required in these situations. Without a real understanding of the background and no access to test equipment I settled on using an Abracon AB38T 32.768kHz crystal with two 22pF capacitors, which is the setup shown in the image below — it allows for 1.5pF of stray capacitance which I can only assume is realistic because so far I have got good results from the setup. I normally use 5 volts for my circuits, but in the longer term I plan to supply this circuit using button power cells which are 3 volts each, so a two-cell holder — a Keystone 1025 (Farnell 3029815) shown below — will supply 6 volts to the voltage regulator input. A 6-volt input to a regulator that outputs 5 volts is marginal at best as most 5-volt regulators specify an input of at least 7 volts, and the LM7805CT I have normally used in the past specifies 10 volts although I routinely used 9-volt batteries with them. In contrast a 3.3 volt regulator with a drop-out voltage of 1-2 volts needs a supply of 4.3-5.3 volts, which is comfortably below the 6 volts that two button power cells are expected to supply. The two chips used by this circuit — the PIC16F1823 microcontroller and the PCF85162 driver for the LCD display — are both happy running with either voltage, although flashing a firmware to the microcontroller still requires 5 volts. This is not an issue as the circuit can be powered through the flashing header as well as via the built-in power regulator. In terms of architecture the firmware is much the same as the time-keeping firmware used for the LED-based timer: A state machine that uses Timer1 with an external crystal and updates a display via I2C. However rather than re-using the previous C-based firmware I decided to write a new firmware in assembly. This is due to doubts about accuracy of timing given how many instructions C code tends to compile to, as well as a general feeling that PIC chips are simply an outright bad target for C code. This is not the first PIC microcontroller firmware I have written entirely in assembly, but it is the first that I have made publicly available in its entireity. The LED-based timer had only two buttons: select and action — the select button switched between three states: count-down, increment-minute, and increment-second; the action button acted as a start/stop button for each state. The original idea was to extend this so that the minute & second adjust states had buttons for both increment and decrement, but instead a single time-adjust was used where seperate buttons for incrementing the minute and second digits. The start button was used to add in a reset to 00:00 function while in the time-adjust state. At time of writing I was thinking of allowing the minute & second increment buttons to be used at any time, and if I do opt for this it will be reflected in the Bitbucket repository. A source of inaccuracy in overall timing is the delay between the crystal-driven Timer1 timeout and the setting-up of the next timeout, which with the previous LED-based was compensated for by adjusting the count-down timeout by trial-end-error. In this new firmware the countdown code-path is a potential 72 cycles which at a clock speed of 2MHz would take 144μs — for the maximum 99:59 timing duration which is 6,000 seconds (i.e. tics) this is a worst-case error of 864ms. In this case I think a maximum cumilative error below the resolution of the display is acceptable. Even this error could be eliminated by using an interrupt handler as upon timeout the handler starts within a small and predictable number of instruction cycles, but on the whole I prefer to use polling rather than interrupts in firmware. Since a microcontroller spends all its time waiting for events and an interrupt handler would in any case need to do polling to find out what event caused the interrupt, it is just easier to simply do the polling in the main execution path. I tend to use 4MHz as a PIC microcontroller clock speed because it results in a 1μS instruction execution time, but given the low-power nature of this circuit and the actual timing being independent of the clock speed I looked into whether the microcontroller could be clocked lower, even though I am uncertain whether under-clocking a PIC microcontroller actually saves much power in practice. The limiting factor was the clock speed needed for I2C, and from my calculations a clock speed of 2MHz with a clock divider value of four was the lowest that would accurately support the bare-minimum 100kHz BAUD rate, so 2MHz is what I went with. When it comes to writing PIC assembly it is great when you are dealing with individual bits, be it input/output values or individual flags within registers, and for the type of predictable bit-banging that PIC microcontrollers are commonly be used for this is perfect. However when it comes to higher-order logic and dealing with variables PIC assembly soon becomes a right pain — and it requiers a very different way of thinking compared to general-purpose programming. There are various ways of coping with all this, which is covered in the following sub-sections. The difficulty of programming if-then-else in PIC assembly, particularly as the only conditional execution is whether a single instruction is skipped or run, makes it preferable to flatten out the code for each state and sub-state. This involves thinking in a very different way to general-purpose (i.e. desktop) programming, which takes a while to adapt to — compare i2cWaitIdle with the C based equivilent. In the process it will quite likley involve things that would otherwise be considered bad software engineering, which highlghts why firmware programming is a distinct skill. I can foresee myself at some point in the future developing a collection of generic macros, especially for arithmatic operations. Lastly one of the nicest comparions with PIC programming in C — cheap function calls with parameters. Or rather a parameter, which in practice is all that is really needed in a surprising number of cases. In C there is no access to the W register so any function parameters have to be passed in global variables, but in assembly passing a parameter forward and back is dirt cheap. In developing the firmware there was only one bug that proved hard to track and fix, and that was alarm state never being entered when the timer expired. Instead it was jumping straight to the idle state rather than waiting for a button press. Within the procTic routine — shown below — checks for zero are done by looking at the carry/borrow bit after the respective decrements using SUBWF. However when time is up, which is when procTicOver is reached, the minute and second counters would both have wrapped around to 255 due to the decrements and these left-overs from the calculations were not being cleared. These values would end up getting passed to lcdGetSegments resulting in the PIC assembly equivilent of an array overrun by the BRW instruction. Execution was jumping somewhere — probably the time-adjustment routines — that was then falling back to the idle state. The underlying issue is how much care needs to be taken to clean up state after coincidental calculations, in this case the in-place subtraction that is written back before the zero check. Mercifully with the PIC16F1823 96 of the 128 bytes of data memory and the vast majority of the registers required for this firmware are on Bank 0, so any functions that need to switch to other banks — just I2C stuff in this case — do a switch back to Bank 0 as a routine part of pre-return cleanup. However it is all to easy to miss a bit of cleanup, and this adds to the debugging effort. Using an external crystal makes a huge difference to timing accuracy — how the internal clock translates into timer increments seems to differ from what the specs say and that is even before considering jitter of the internal oscillator, but with a 32kHz crystal 32,768 pulses means 1 second. The small adjustment needed with my first crystal-based timer was probably due to how many instructions that C code compiles to and the major reason I wrote the firmware in assembly was with this in mind — using assembly for this circuit eliminated any need for an offset. I doubt I will use C again for PIC programming. As with previous timers I compared this circuit with a reference timer on my mobile — in some test runs it seemed that that firmware timer had fallen behind by a noticable amount (perhaps a third of a second) after about half an hour, but this difference had disappeared after the full hour had finished. In the absence of any instrumentation to quantitate error rather than relying on looking at two timers side-by-side, looking at cumilative error is my only realistic test metric — and on this metric the circuit is accurate. This circuit is really just to provide reference hardware for firmware development, and as a result the latter is what this article focused on — in particular being entirely in assembly rather than C, which in practice meant that using the previous firmware as a template caused as many problems as it solved. Nevertheless with one exception there were no real surprises or problems, with an initial mistake regarding endianness of the LCD segments being part of the fun in building this circuit. That aside I now seriously doubt whether I will ever use C again for PIC firmware. The next stage is getting a PCB version of the circuit and mounting it inside a box, which will be covered in a future article.